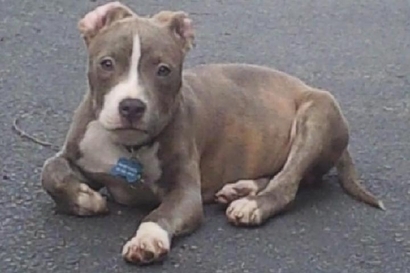 Out of Prince William Country, VA comes a super upsetting story of a stolen pit bull puppy that was a high school graduation present to the owner’s daughter. The topper is that the puppy was taken right out of the owner’s vehicle. According to NBCWashington, last Friday, the owner was parked outside a convenience store along Jefferson Davis Highway in Woodbridge. He left the pup in the car, went into the store for just two minutes, and when he went back to the car, the dog was gone. The little fellas name is Charlie, he’s very friendly, is gray and white and was wearing a name tag. Anyone who may know anything about the dog’s disappearance should call Prince William County police at 703-792-6500. Have they checked at shelters? not sure how serious it is out here but when I lived in CA, “Animal Lovers” would often remove animals from vehicles because they felt the dog was being neglected. It occurs to me that if you have time to steal a dog and take it to a shelter because you’re concerned that it’s been locked in a car (not an invalid concern), you have time to hang around for a couple of minutes to monitor the dog and see if the owner comes back. Especially since it’s a convenience store- it’s not like the car owner was going to be in there for hours. Children and pets should never be left unattended in cars. It’s always “just two minutes” or “just a moment” or “only an instant.” I don’t buy it. Yeah, PW County, expensive puppy, unlocked car, bye bye Charlie. stealing is unacceptable and criminal. also given the breed of the dog, I think the abduction raises suspicions and fears that he might have been stolen for dog fighting. an even more serious offense.